Relevance The invention provides a nucleic acid expression construct encoding a fusion protein comprising a fluorescence reporter protein (like EGFP) and a protein with a wild-type destruction signal (like Anillin). Localised to subcellular structures during cell cycle progression, it presents a fluorescence marker for imaging cell cycle progression in vitro and in vivo. 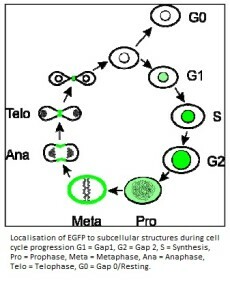 The cell cycle comprises consecutive phases termed G1, S (synthesis), G2 (interphase) and M (mitosis). Cells that temporarily or reversibly stop dividing enter quiescence, named the G0-phase. To differentiate between cells that start to divide again and resting cells in still an unreached goal. In addition, available cell cycle indicators are unable to distinguish between cell division and acytokinetic mitosis which is karyokinesis without cytokiensis or endoreplication which is continuing rounds of DNA replication without Karyokinesis. The Anillin fusion protein is located in the nucleus during G1-, S- and G2-phase, in the cytoplasm and cell cortex in early M-phase, in the contractile ring during cytokinesis and in the midbody just before absission, making it possible to distinguish between different phases. At the end of mitosis the fusion protein is degraded by the proteasome. Therefore, cells arrested in G0 do not show any fluoroscence. Hesse et al. 2012. Nat Commun. 3:1076. PMID: 23011130. Direct visualization of cell division using high-resolution imaging of M-phase of the cell cycle.